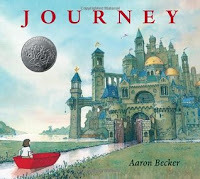 The young girl who stars as the central character in this wordless picture book trilogy by Aaron Becker begins Journey feeling bored and left out amidst her busy family's other obligations. After asking each member of the household to spend time with her and being rejected, she, much like Sendak's Max, sets out on a journey. She begins by drawing a doorway into her bedroom wall with a red piece of chalk. The passageway she opens leads her into another world, where she is greeted cheerfully by soldiers, and then witnesses the capture of a beautiful purple bird. When she tries to free the bird, she finds herself caged, but not for long. By the end of the story, she is safely rescued and in the company of a new friend. The second book, Quest, picks up the two children's adventure just where it leaves off in the first book. The two ride their chalk-made bicycle through the park, where they are approached by the king of the other world the girl has just visited. The king presents the children with a map which will lead them to a piece of chalk for each color of the rainbow. It becomes clear that these chalks are the source of power in the land where the king rules and by tracking them down and returning them to their rightful place, the young girl and boy will restore the king to his full strength. Throughout the book, the two friends work together ingeniously to draw the solutions to the problems presented by various obstacles in their path. Finally, in the conclusion of the trilogy, Return, the girl once again approaches a family member, her father, with an invitation to spend time together, but is ignored. When she retreats once again to the magical world she helped to save, this time her father follows behind. When he finds his daughter, she refuses to speak to him at first, but that changes when the king is once again put in danger, and only the girl and her dad are left free to save the day. I read each of these books independently of the others at the time of their publication. When considering each individual book, the first one, Journey, comes across as the strongest and most compelling. The story is self-contained, with no required prior knowledge and no cliffhangers, so the reader walks away satisfied. The emotions of the story, from the girl's sadness at being excluded by her family, to the exhilaration of saving the bird from danger, to the instant recognition of a new friend at the end, are relatable and they make it easy for the reader to navigate the largely unfamiliar fantasy world. The second and third books, read as isolated stories, don't work as well. Return, especially, requires knowledge of at least the first book, if not the second, to even begin to make sense. When I received my review copy of Return, I immediately needed to reread both Journey and Quest to refresh my memory. Read together, however, these books are truly beautiful. The trilogy reads like one cohesive story with a strong beginning, an exciting middle, and an ending which happily resolves the tension between the young girl and her dad. The illustrations in all three books are distinctive, filled with interesting uses of color and light and unique changes in perspective that show both the large-scale terrain of Becker's world, and the small details within it. Though there are no words at all in any of the books, the reader easily begins to grasp the politics of the fantasy world of the story, and to understand the danger the young characters are in as they try to rescue the chalks ahead of the bad guys because of the many details Becker includes. (Among my favorites are the petroglyphs discovered by the girl and her dad in Return, which provide pictorial backstory.) There is also perfect continuity from book to book, as the bicycle which appears on the final page of Journey is the first image of Quest, and the crown which the king places on the girl's head at the conclusion of Quest is still present on the opening page of Return. Return is a fitting conclusion to this trilogy, and the perfect stopping point for the story arc. The final moment, especially, is subtle, but powerful, and it leaves the reader smiling and nodding that all will be well for our young heroine from now on. Because this trilogy is wordless, it can be enjoyed by children and adults at different levels. Little Miss Muffet found quite a bit to talk about in the illustrations at the tender age of two, and I'm sure her reading will only deepen as she grows. These books are a wonderful addition to any picture book collection, and I look forward to discovering whatever Aaron Becker publishes next.